- Special fuel saving compound with low heat generation gives you lower rolling resistance and higher fuel economy. 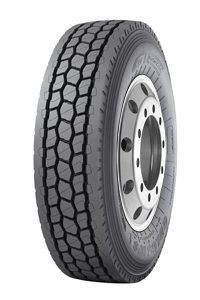 - Four zigzag longitudinal groove design gives you excellent traction and driving stability. - Continuous shoulder rib design gives you improved mileage and high speed performance and prevents irregular shoulder wear. - Optimized block ratio gives helps prevent irregular wear. - Enhanced grove wall angle and tie bar helps protect from stone retention and casing damage.